Four Seasons Hotel, Prague — everAFTER magazine everAFTER magazine celebrates and inspires a couple’s journey from their engagement through to their wedding day and beyond including lifestyle and travel. Wedding venues, bridal, fashion and styling inspiration. Perhaps it’s the sun shimmering on the Vltava River, or the cobblestone streets of Old Town with the comforting sound of horse drawn carriages, or maybe it’s the picturesque view of Charles Bridge, whichever it may be, Prague draws visitors in with its romantic and mysterious feel. Centuries of history are reflected in the city’s diverse architecture and Four Seasons Hotel Prague is no different. Staying at this hotel is opening the door to a vibrant and unexpected experience that seems to mirror the city itself. 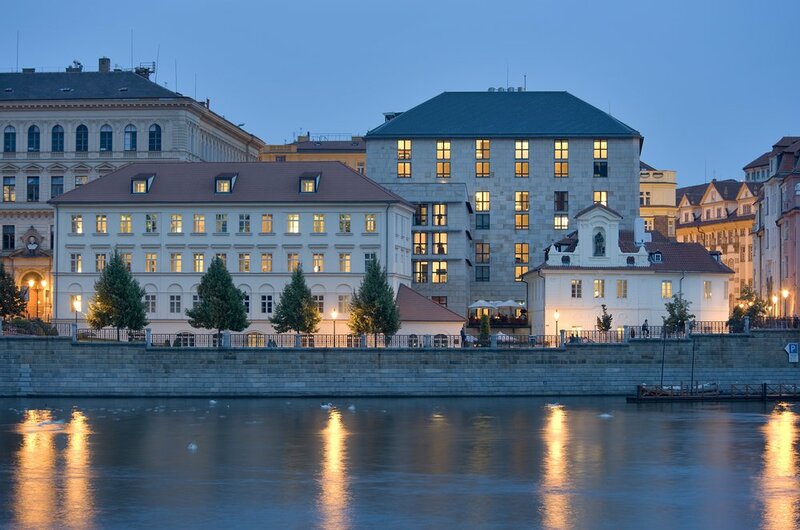 Whether you’re looking for old European charm or your style leans more modern, the hotel’s beautifully appointed rooms come in two design options, but the beautiful views over Prague’s Vltava River remain the same. It is the ideal location for a destination wedding, honeymoon or romantic holiday. High ceilings, traditional Czech-style panelling and Bohemian crystal chandeliers make the largest guest rooms feel like a trip back in time. Experiencing one of Four Seasons Hotel Prague’s Renaissance Rooms is a luxurious stay offering tranquility, privacy and of course 5-star service. With a stunning light blue and celadon colour scheme (interestingly, this jade green colour was once a tone exclusively used for royalty) the Renaissance Room’s colour palette perfectly complements the traditional Czech-style moulding, hand painted stencilling and plush furniture. The room is large feeling more like a suite, with a well-appointed bathroom and every luxury you could possibly need. Four Season Hotel Prague’s other rooms allow guests to trace the history of the city from the Baroque era to the neoclassical to modern day. The service is impeccable and the food delicious. Soak up the views of the river and unwind with a glass of sparkling wine. With Baroque styling and a riverside setting, Four Seasons Hotel Prague offers an array of beautiful spaces perfect for any sized wedding reception. Prague’s most glamorous weddings unfold in true luxury where centuries of architecture provide the backdrop for stellar Four Seasons cuisine and personalised care. In this most desirable Old Town location, at the edge of the Vltava River, romantic magic is woven with fairytale views of the Charles Bridge and Prague Castle. The spacious main ballroom flows outdoors to a riverside terrace, while the Baroque ballroom offers sunlit 16th-century beauty. Executive Chef Leonardo Di Clemente's extensive menu of Italian and Mediterranean dishes at Four Seasons Hotel Prague’s CottoCrudo includes fresh seafood, homemade pasta, choice cuts of meat and artisan products sourced directly from the Piedmont and Tuscany regions of Italy. Here traditional dishes are complemented by a live crudo bar, where chefs prepare fresh seafood right before your eyes. Four Seasons Hotel Prague is also home to a Chocolate Vault, a secret room decorated entirely in chocolate, including the walls, for sampling sweet creations from the hotel’s resident pastry chef. Whether it's a romantic meal for two or an intimate gathering of friends and family, you can have the 5th-floor rooftop terrace, and what seems like the entire city, all to yourself. With an extensive wine list and a sophisticated selection of classic and eclectic cocktails, the modern bar and lounge CottoCrudo is an ideal spot to meet for drinks and a bite to eat. Take a ride down the Vltava aboard Four Seasons Hotel Prague’s wooden riverboat. Be inspired by the scenery of this enchanting city all with a glass of bubbles in hand. Experience centuries-old healing traditions mixed with modern technologies in one of Ava Spa's five treatment rooms, all set in a historic neoclassical building overlooking Prague Castle. Relax in the healing waters of the hotel’s exclusive, Czech-inspired, traditional mineral baths, enhanced with essential oils and flower petals. Bali's luxury travel scene is booming and ready to cater to your every desire. The luxury experience of staying at one of Mandalas architecturally designed villas begins from the moment you arrive. Your choice of villas awaits! A romantic stay in Colorado conjures images of keeping warm by the fire after a day on the slopes, however the mountainous state is open to an array of romantic getaways year-round – from staying in rustic wooden chalets in former ghost towns to riding across the USA’s tallest sand dunes on horseback or taking a dip in one of the state’s many natural hot springs, Colorado’s majestic scenery can be the backdrop to an array of honeymoons and couples retreats. ‘Riverside elegance in Europe’s golden city.’ There’s a certain magic in the air that flows effortlessly through Old Town Square, onto Charles Bridge, over the Vltava River and all the way up the tallest spires of Prague Castle. Experience it all from your doorstep at Four Seasons Hotel Prague. Some places remind you of the richness and beauty nature bestows and allows us to breathe and change gear for a moment. A mere three hours drive from Melbourne and you are enveloped in a pristine bush that overlooks mountains offering the most remarkable views not to mention unexpectedly luxurious accommodation. Dine under the stars, take part in alfresco cooking and cocktail classes, or embark on an outdoor adventure with the wind in your hair. We’ve collected our favourite reasons to see, savour and stay with Belmond, perfect to inspire your next trip, honeymoon or european adventure. With warm temperatures lasting until October, your Dolce Vita summer awaits. To fall in love is something amazing. To celebrate your love and get married in the most romantic city in the world, well... that’s what dreams are made of. That dream can become a reality. Shangri-La Paris, the former home of Napoleon Bonaparte’s grandnephew Prince Roland Bonaparte. At Shangri-La the royal treatment lives on. Morocco is a place on many people's wanderlust list. A place so rich and inspirational in culture, custom, architecture and history. For Europeans, Morocco is a short and direct flight away, but for Australians the journey is long. It was absolutely worth it however despite our lost luggage, but that's a whole other story! The best that Northern Territory has to offer for honeymoon destinations, wedding hotspots and picturesque proposal sites. Stopping over or visiting this metropolis of Asia. This is our list of 5 things to do. Byron Bay is well known for being a place of holidays, healing and nature but before you begin to explore the outdoors, welcome to your home away from home at 28 Degrees.